My mom is an obgyn so I grew up with her magazines laying about and her speaking to patients over dinner about vaginal discharge. Still, I felt unprepared. She told me what was coming but it seemed unreal, especially the bleeding part. I remember by breasts forming, the acne, and my labia growing. At the time, I thought my enlarged labia meant I had super powers! I never told anyone but I held on to the belief… And who knows, I was probably right! The day my period came I was home with my dad. Mom was working and so I had to tell him. He became flustered and immediately called my mom to come home. I had flashbacks to the incredibly outdated video we watched in school about tying napkins to menstrual belts. Why were we watching a video about menstrual belts?? I guess being informed and feeling prepared wasn’t the goal of that particular educational movie. My mom came home twenty minutes later. I waited for her in the bathroom. She seemed excited as she helped me put on my first pad (a very large monstrosity). Then her face turned grave and she said I could get pregnant now. I’m not sure I fully understood but I nodded. Then she told me that the first three days I was considered impure and couldn’t go to the temple or touch the altar in our home. This information didn’t really jive with my new found superpowers, but I didn’t say anything. Getting to stay home from trips to the temple seemed like a good thing at the time. More time to attend to the very serious business of recording my own MTV show and practicing to be Janet Jackson’s back up dancer. We left the bathroom and the day proceeded at usual. But it wasn’t just any other day. The world had changed for me and I couldn’t wait to tell my friends! Join us! On Father’s Day (June 15th) and the Day of the African Child (June 16th) to highlight ways in which men and boys are engaged in and can mobilize to end/prevent Violence Against Women and Girls (VAWG). VAWG is a grave violation of human rights and bodily integrity, that not only affects the well-being of women, but their families, their community and country-causing greater healthcare/legal expenses, losses in productivity and overall development. This conversation is a follow-up and a response to the following ongoing campaigns: #EndChildMarriageNow (Africa Union 2-yr campaign), #TimetoAct, #MenstruationMatters, #BringBackOurGirls, #JusticeforLiz, #WEA and #TheAfricaWeWant. This is also the first in our series to raise consciousness for gender equality using hashtags #Men&Boys to #EndVAWG. We want to know how your country is engaging #Men&Boys to #EndVAWG | what the challenges are | why it is important to engage #Men&Boys? | And is violence against women and girls a #Men&Boys issue? Join in from June 15-16 to engage in dialogue that illustrates the progress, challenges and solutions to #EndVAWG. 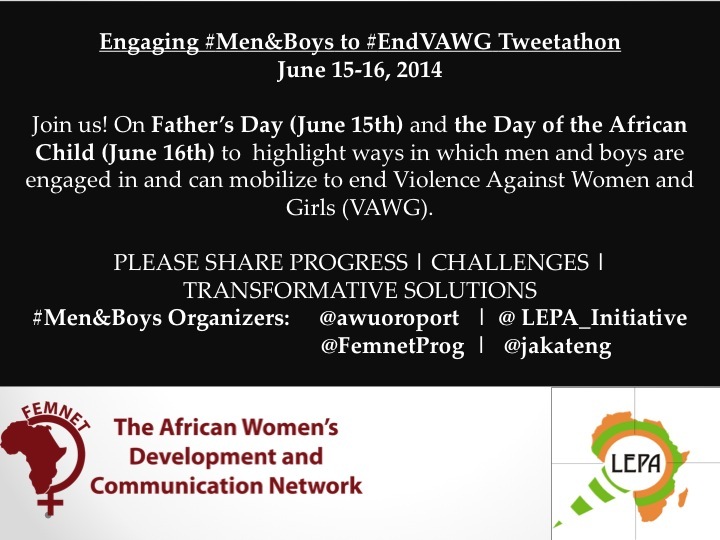 Please use the hashtags: #Men&Boys and #EndVAWG on Twitter and Facebook. Find our social media toolkit here, and invite your friends on Facebook. Importantly, to help us stay in touch with you, and improve the sustainability of #EndVAWG via #Men&Boys as allies, take 2 minutes to participate in this survey. We look forward to engaging with you on Twitter and Facebook.